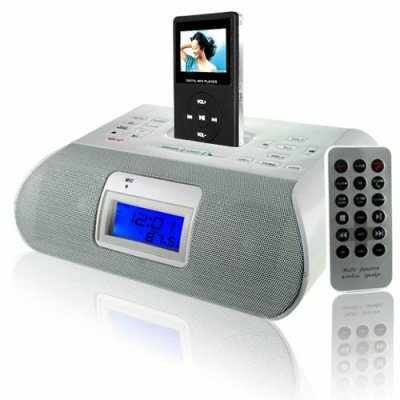 Successfully Added iPod + MP3 Clock Radio with Bluetooth - White to your Shopping Cart. This incredible ipod and MP3 Bluetooth clock radio has just landed, and its already got everyone talking. Easy mobile phone calling via bluetooth and the unit's microphone and speakers is now possible from anywhere you choose. The ipod connector will also charge your apple ipod overnight so it's freshfirst thing in the morning and there's also an auxiliary connector if you haven't joined the apple crowd yet.